is preserved at the LVVS museum at Lincoln. 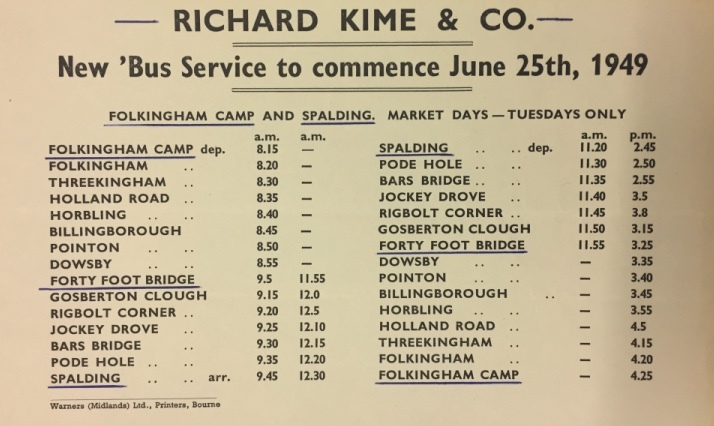 The bus route (but not the coaching business) passed to Kime in 1970.
modest sized villages like Woodnook and Sproxton seem to have been very well served too. 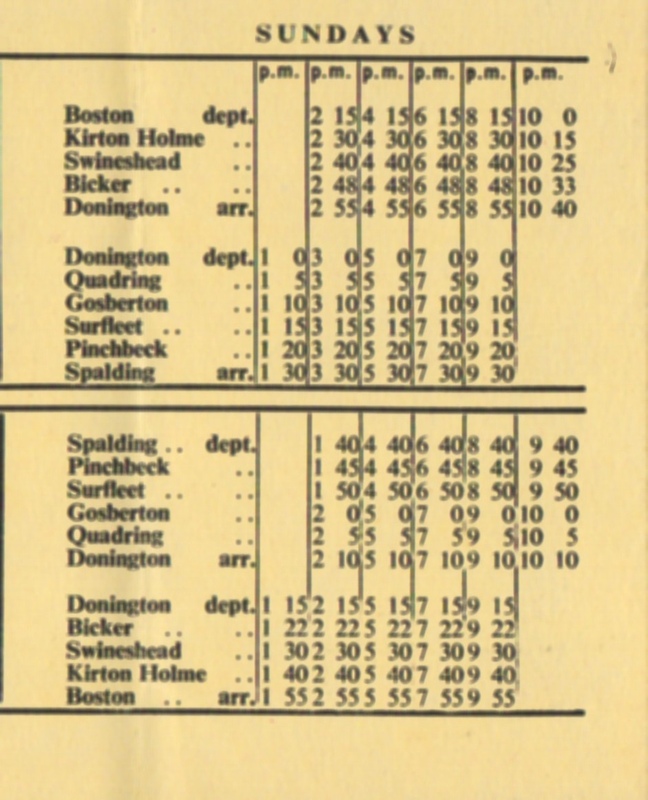 The routes passed to Lincolnshire Road Car in 1936. 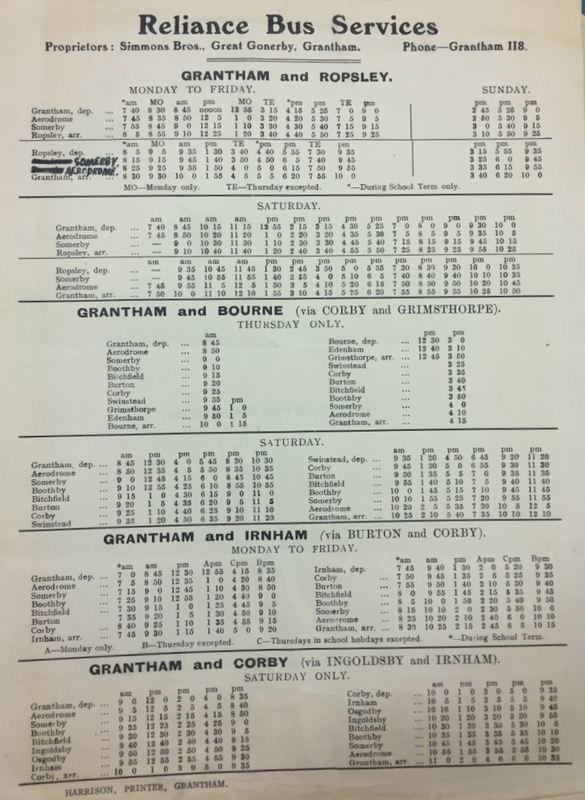 The timetables below are for the Bourne to Peterborough and Bourne to Stamford routes and are believed to date from the 1960s. 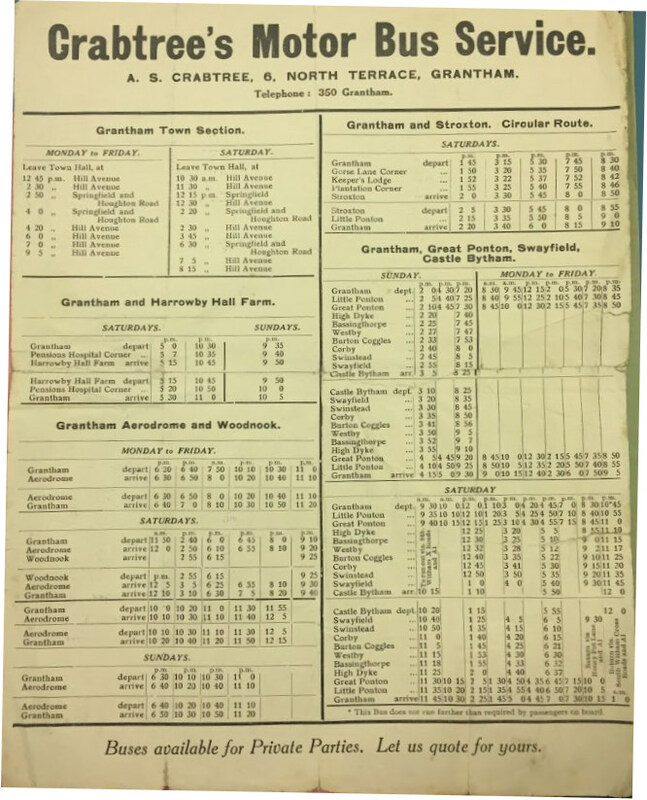 The Peterborough route started in 1923 and was the most important for the business as Peterborough grew in post-war years. 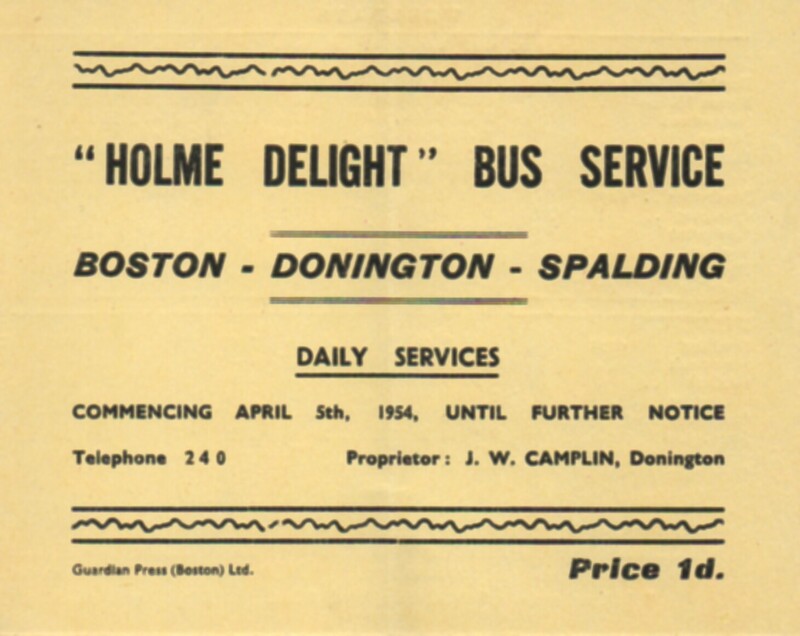 1995 is called Delaine Buses Limited, operating with an all bus fleet. 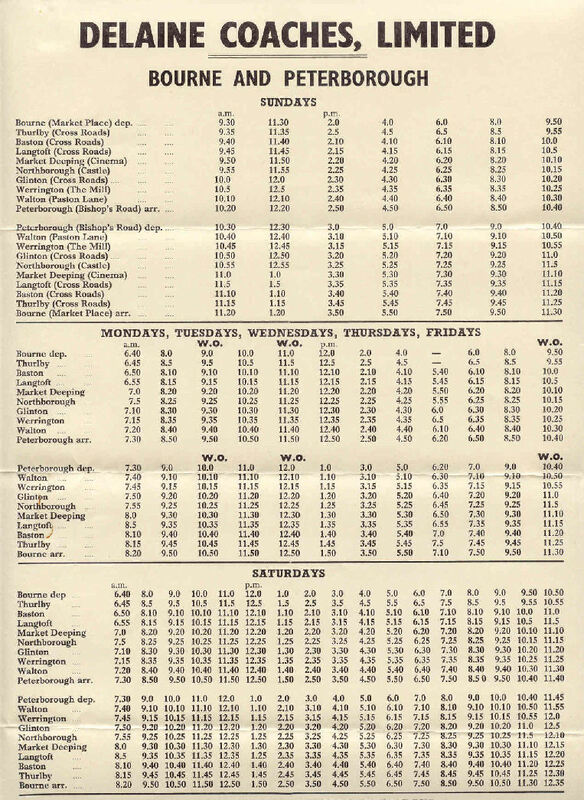 January 1962 timetable for the jointly operated Bourne to Sleaford service. 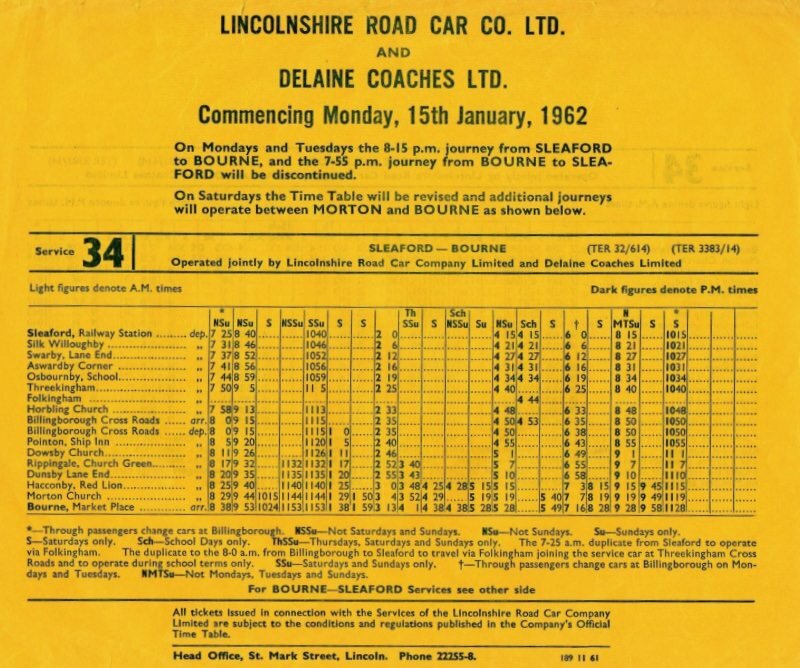 From 1961 to 1980 the Bourne to Sleaford route was unusual in being jointly operated with Lincolnshire Road Car service 34, thought to have been one of the first - if not the first - joint operation between an independent and a state-owned company. This initiative saved Road Car outstationing three vehicles overnight in Bourne. 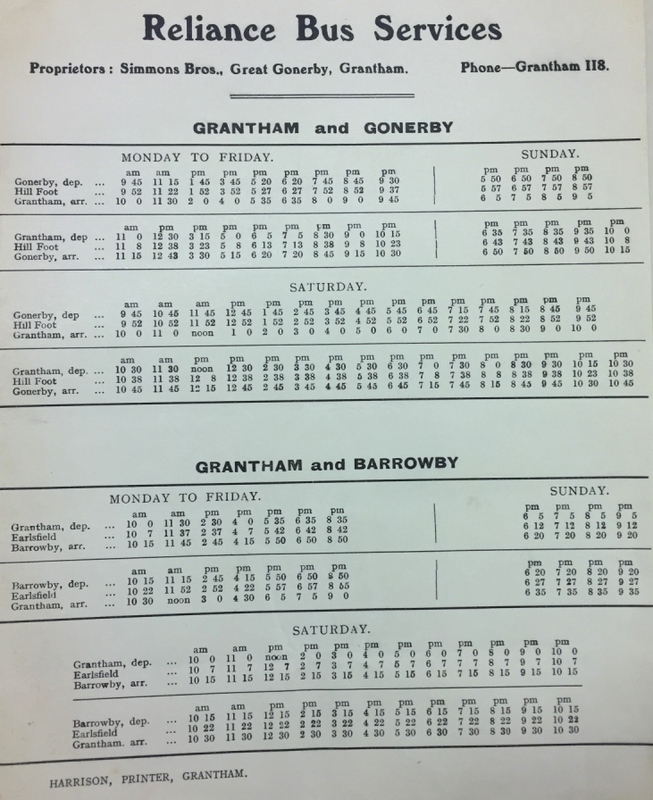 Grantham continued until the mid-1980s when the premises became KwikFit. 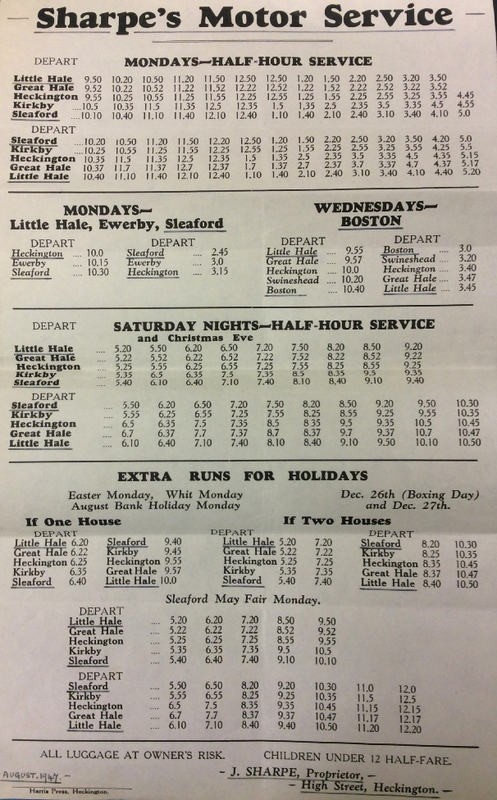 Boston and Spilsby. 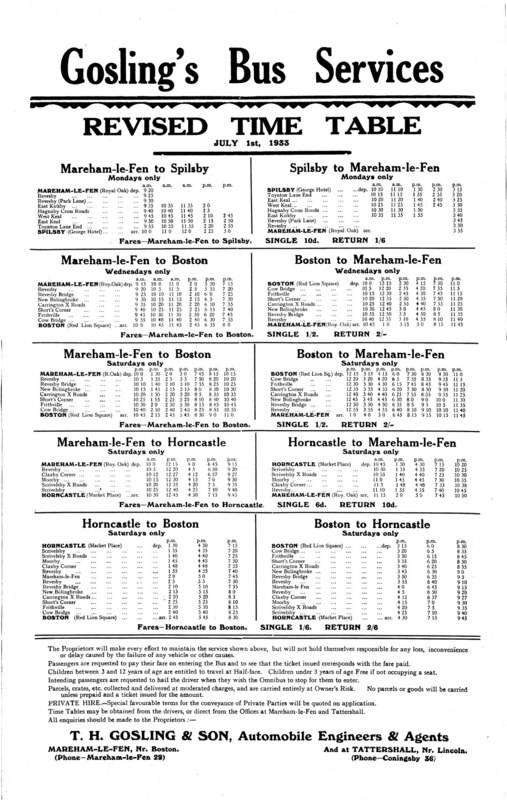 This 1933 timetable was conceived to meet the needs of shoppers and market-goers. 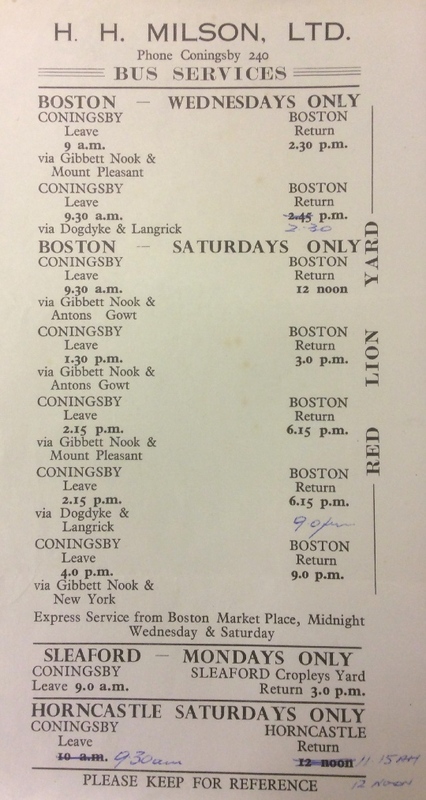 The bus routes (but not the garage business) passed to Milson of Coningsby in March 1960. 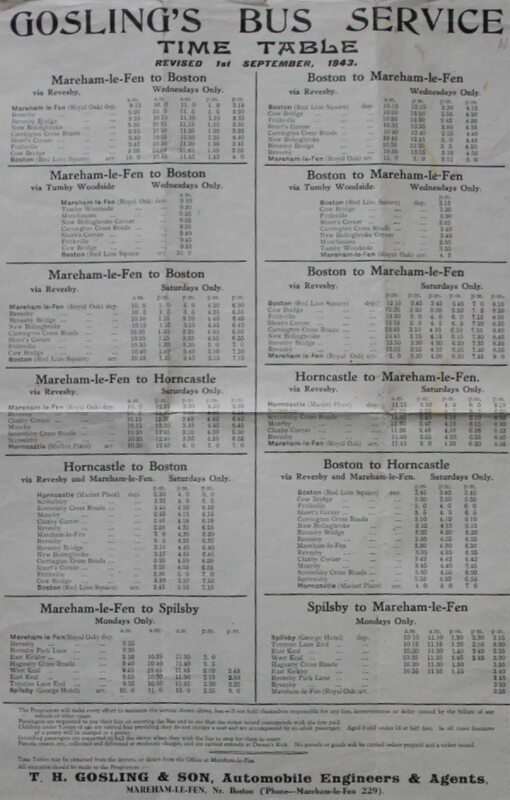 The September 1943 timetable below showed little change over the 1933 timetable above except for the second route to Boston via Tumby Woodside on Wednesday; and a reduction in the number of journeys to Boston on the original route from Mareham via Revesby (from six to five on Wednesday and from seven to five on Saturday). 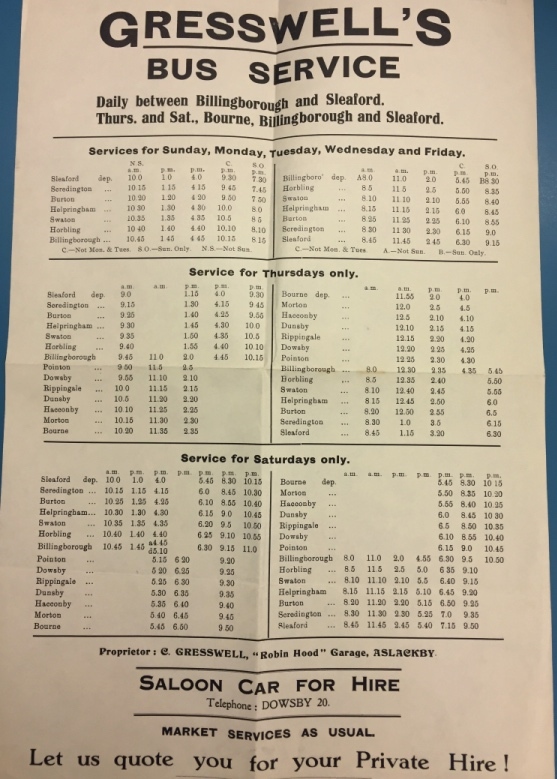 The Skegness service was suspended during the war with anticipated reintroduction in 1946. 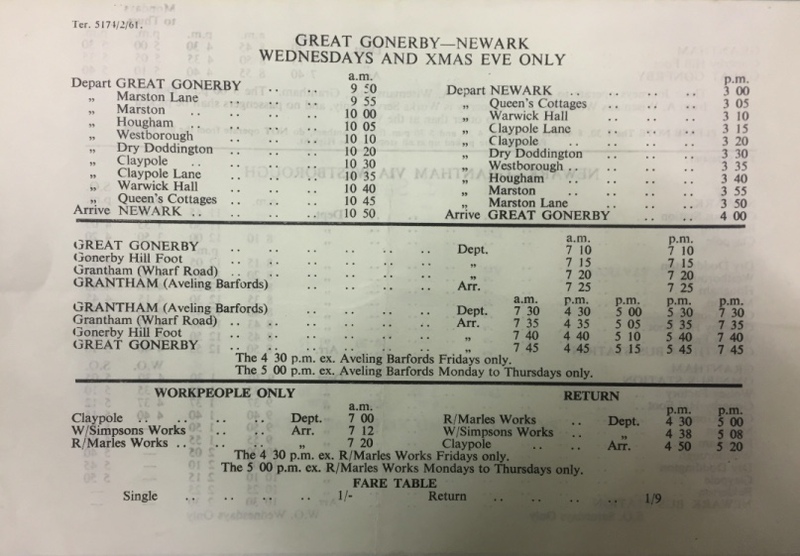 The timetable below from June 1959 (probably the last issued by Gosling's) shows surprisingly little change over the 26 years since the 1933 timetable above. 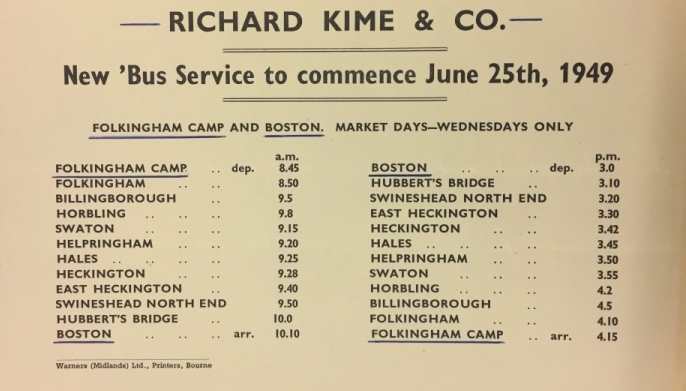 The Wednesday service to Boston via Revesby reduced from five to four journeys but a Wednesday service introduced on the alternate route via Tumby Woodside. 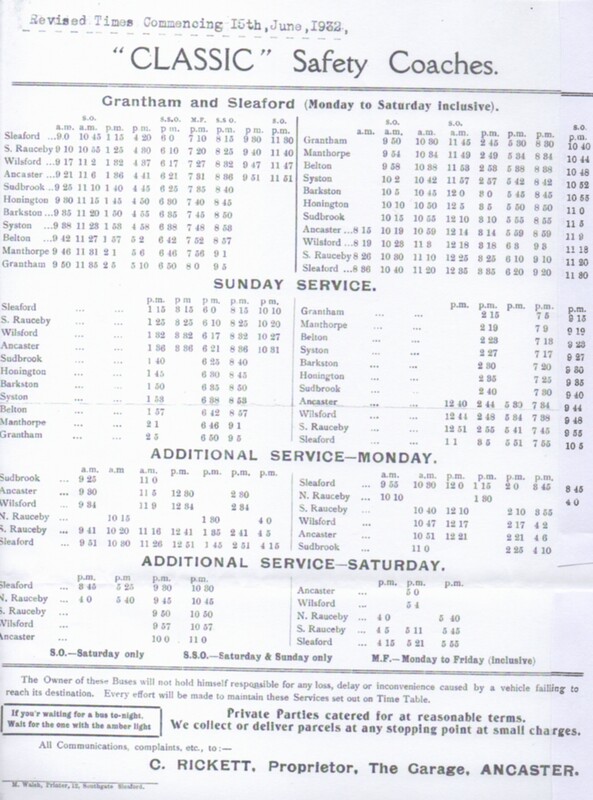 On Saturday the Revesby route restored to 1933 levels, increased from five to seven journeys again. 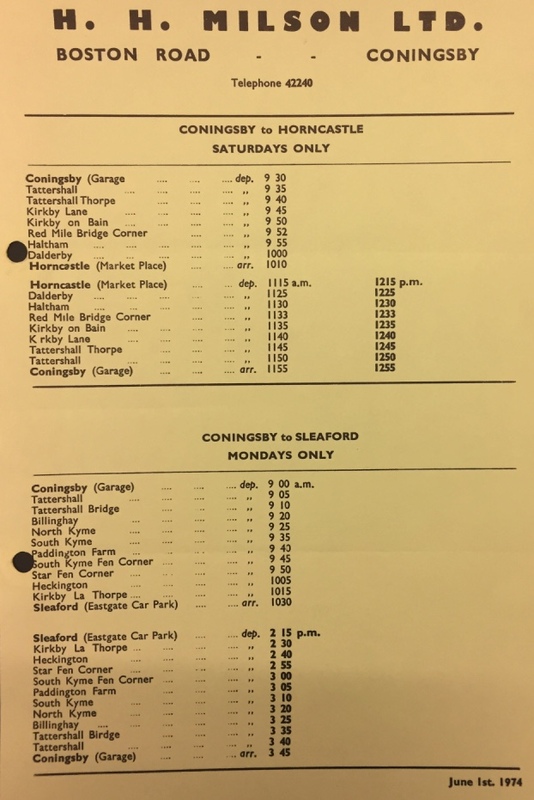 The Monday route to Spilsby has gone; but this appears to have been reinstated after the takeover of routes by Milson of Coningsby. 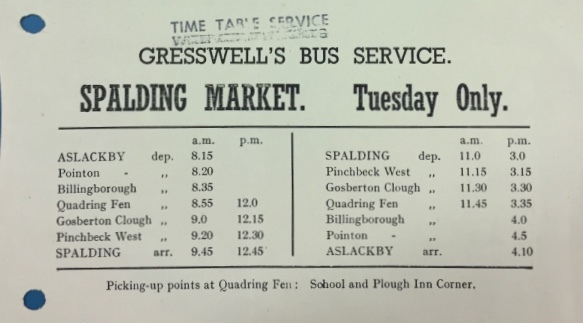 Pre-war timetables for three of Greswell's routes before the move of operations in 1939 to a new base in Victoria Street, Billingborough. evening for cinema. 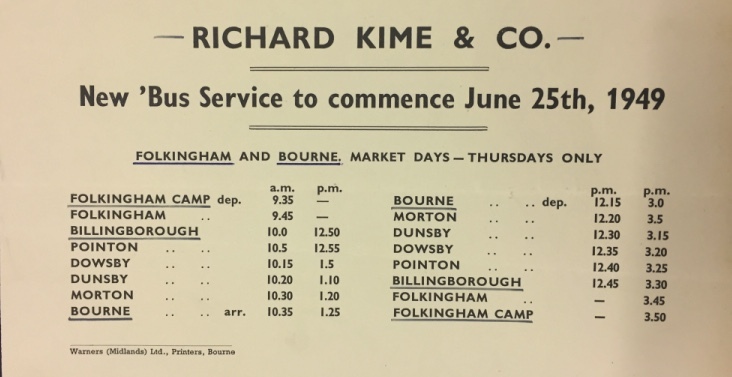 There was also another Thurday market route to Bourne via Kirkby Underwood. 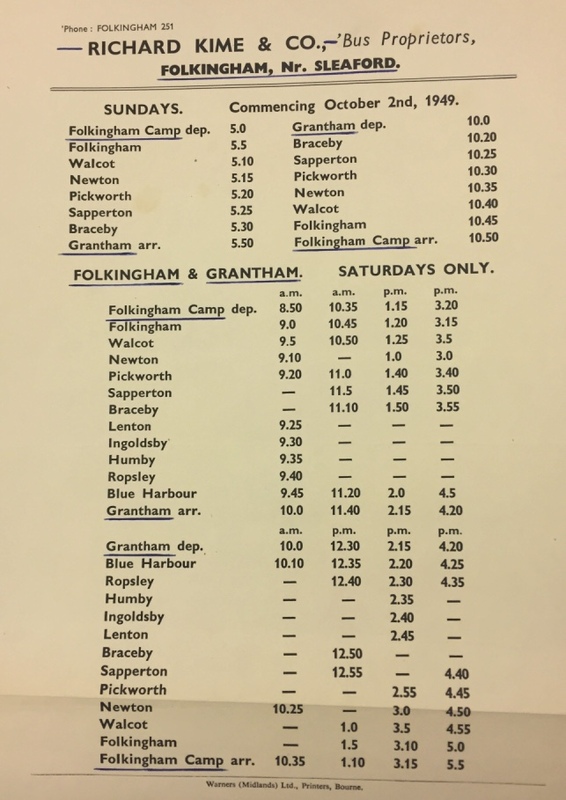 The first timetables below are from 1949 with the extension of the routes from the village to serve Folkingham Camp. 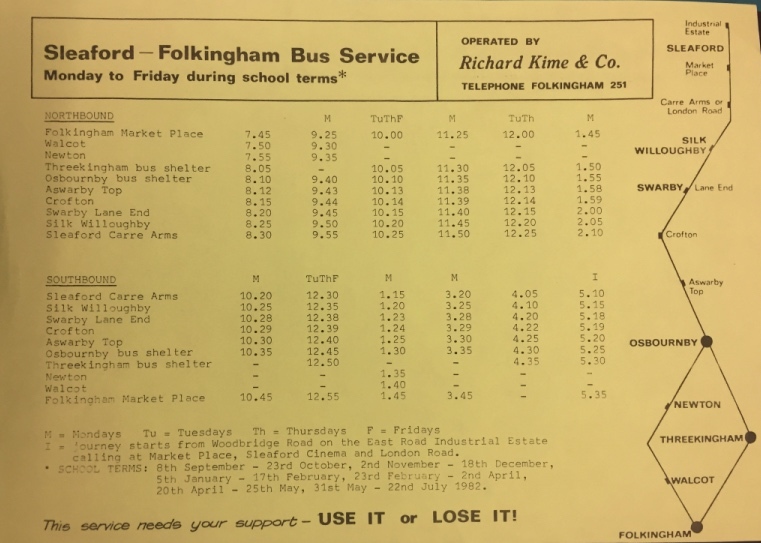 with services radiating from Folkingham in various directions each day of the week except Friday. 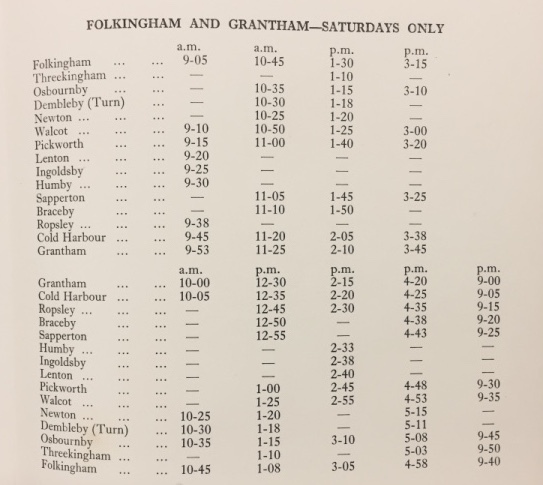 (The timing point 'Blue Harbour' in the Grantham Saturday timetable should be 'Cold Harbour'). 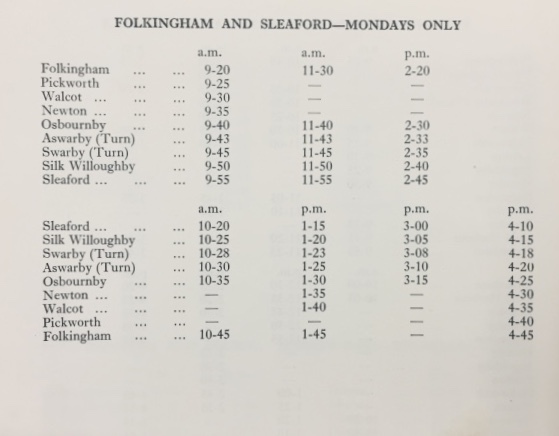 published between 1956 (Spalding route discontinued) and 1972 (introduction of daily Grantham service). 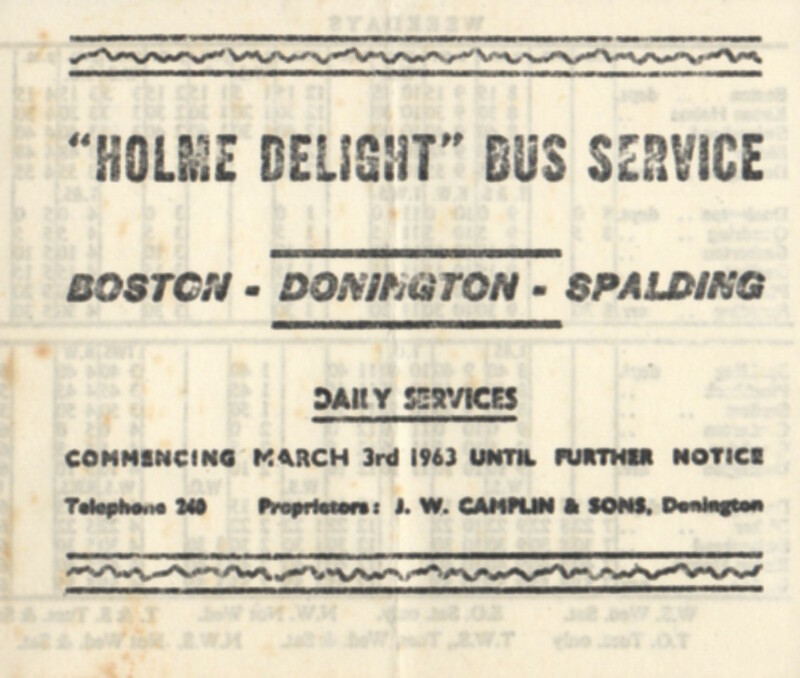 In 1970 Kime's Coaches took over the route from Boston to Spalding previously operated by Camplin of Donington (see above). 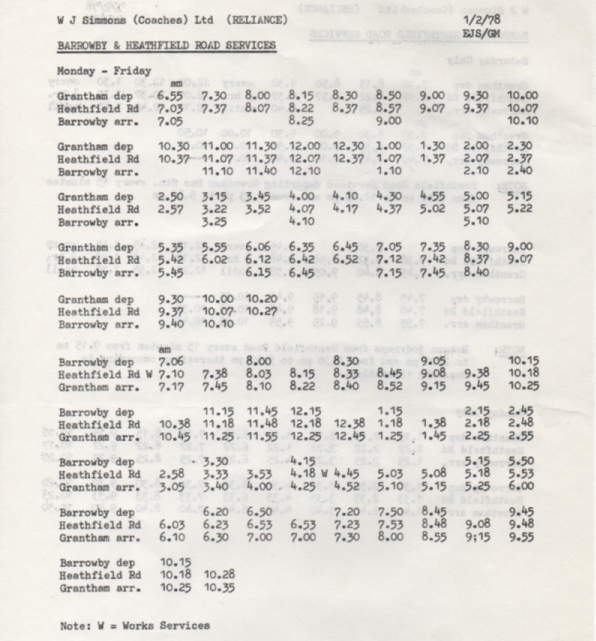 This is the timetable from March 1974. 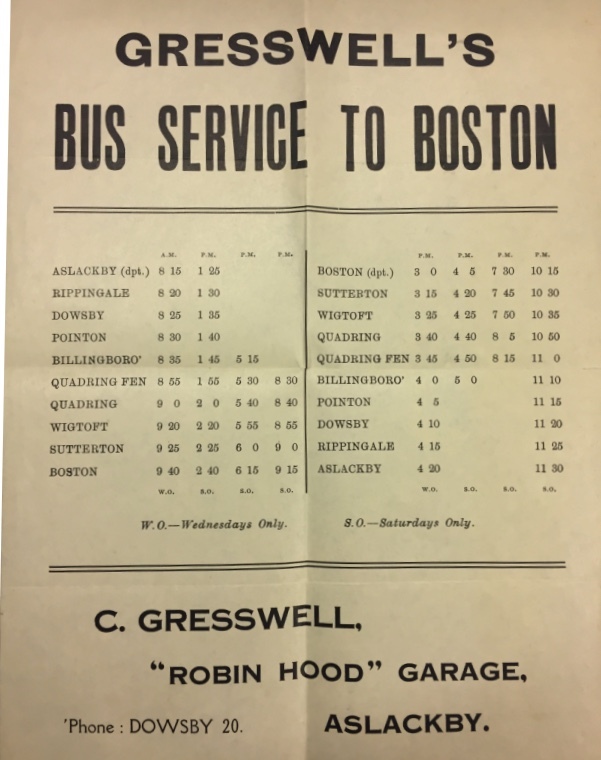 This was their first expansion into regular all day daily bus operation. 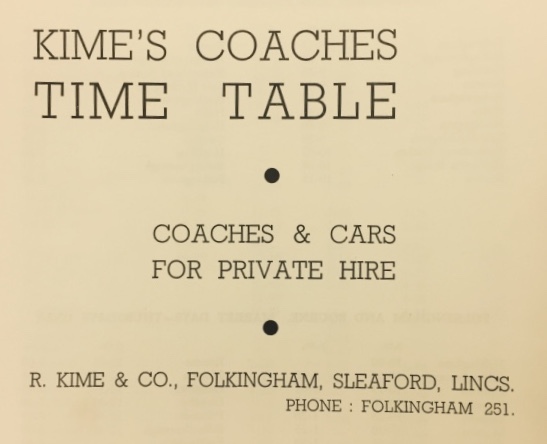 In 1972 Kime took over the former Road Car route to Grantham. 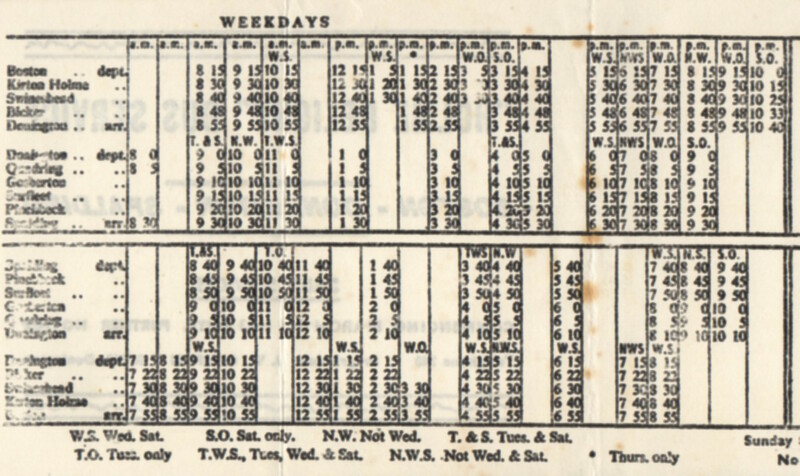 This was a considerable expansion into another daily operation. 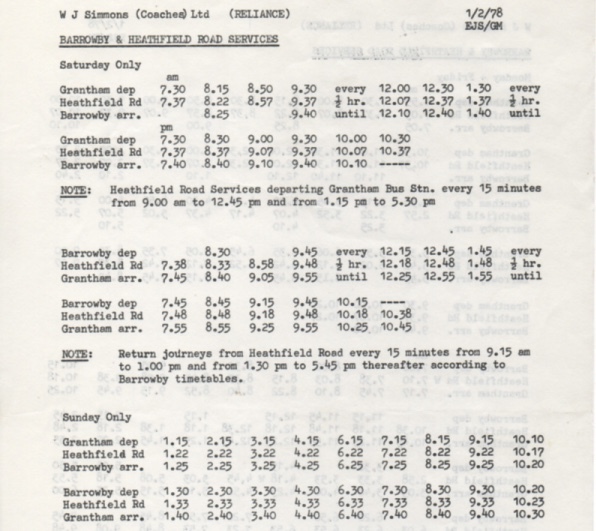 The timetable below from September 1974 shows route revisions and the extension of the route to include Rippingale. 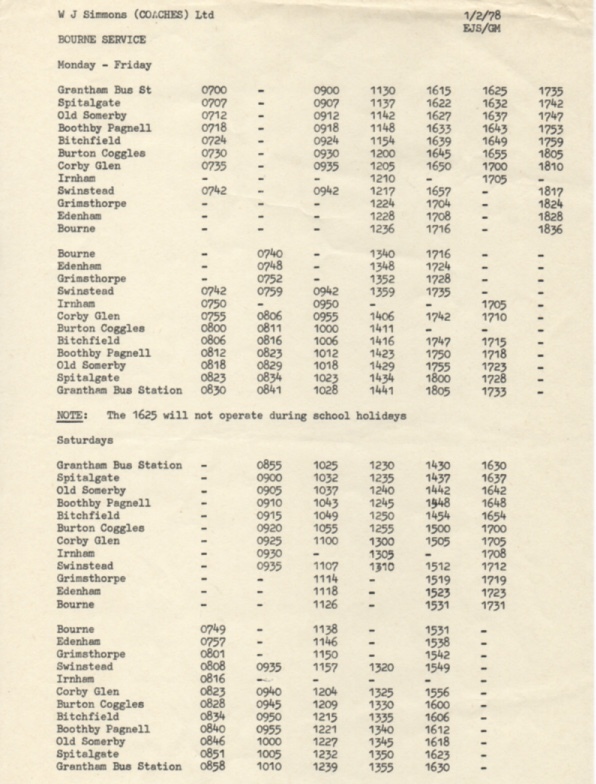 The restrictions on certain journeys relating to Ropsley were to protect the long established Reliance service. 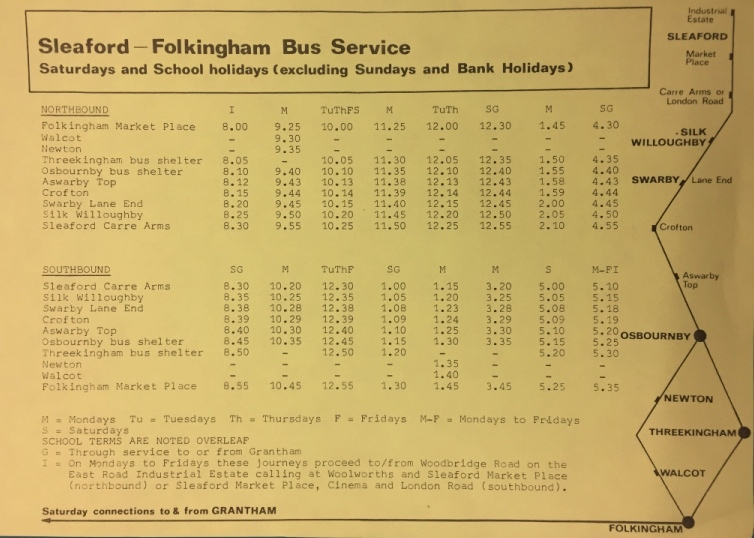 1981 saw expansion of the Folkingham to Sleaford service into daily operation as Road Car withdrew from the road. 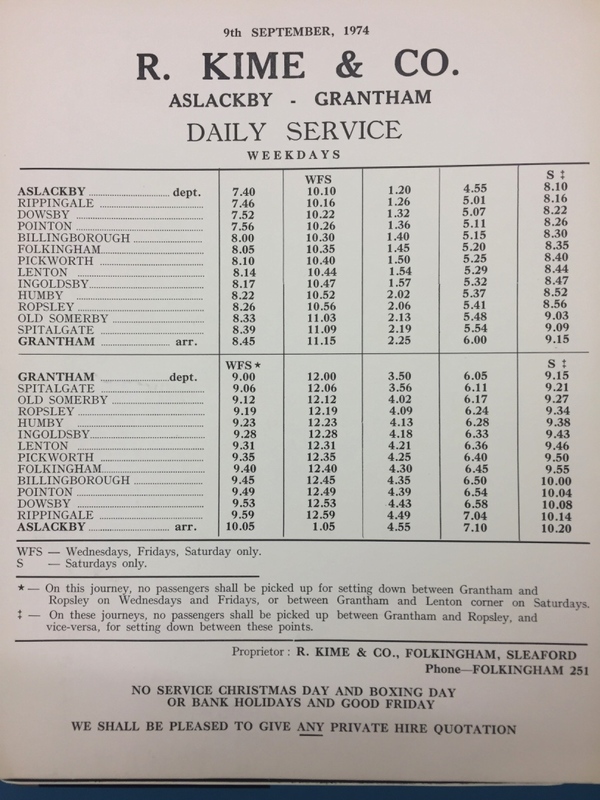 to Grantham on Saturdays. 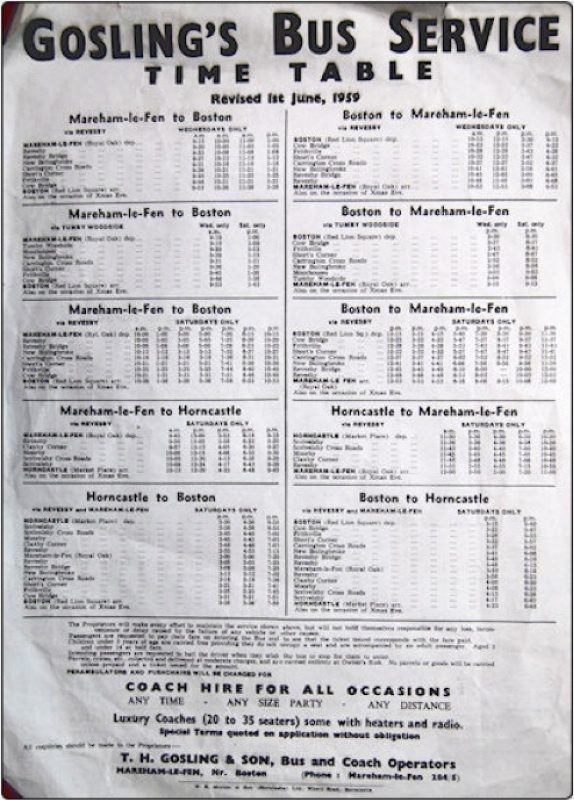 Also see the driver's Saturday instruction sheet illustrated below. 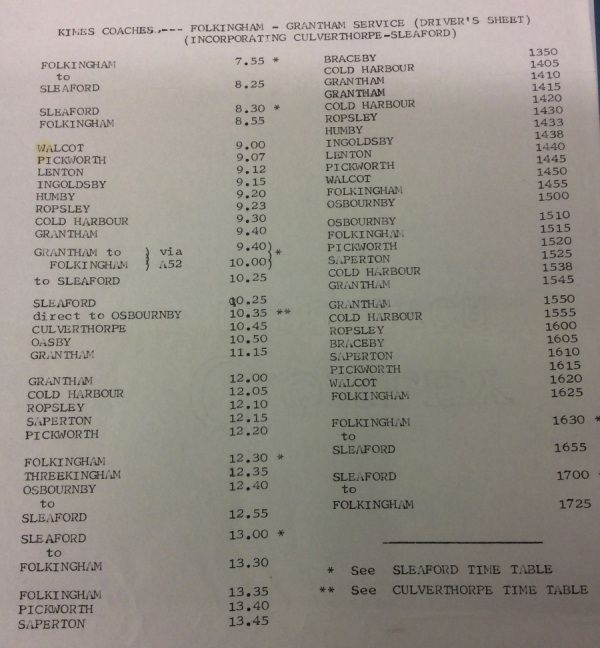 to Sleaford with other routes including both Grantham via Culverthiorpe and Grantham via Ropsley. 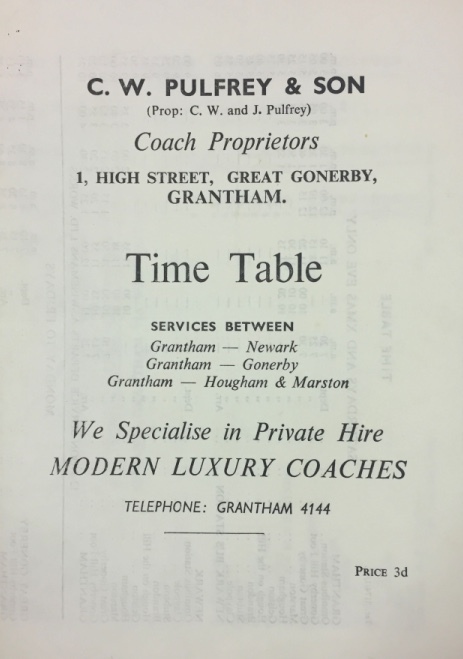 A busy day - the only break for the driver being at Grantham from 1115 to 1200.
the fourth from the pre-1960 era.The Monday market service to Spilsby is included in the Skegness timetable. 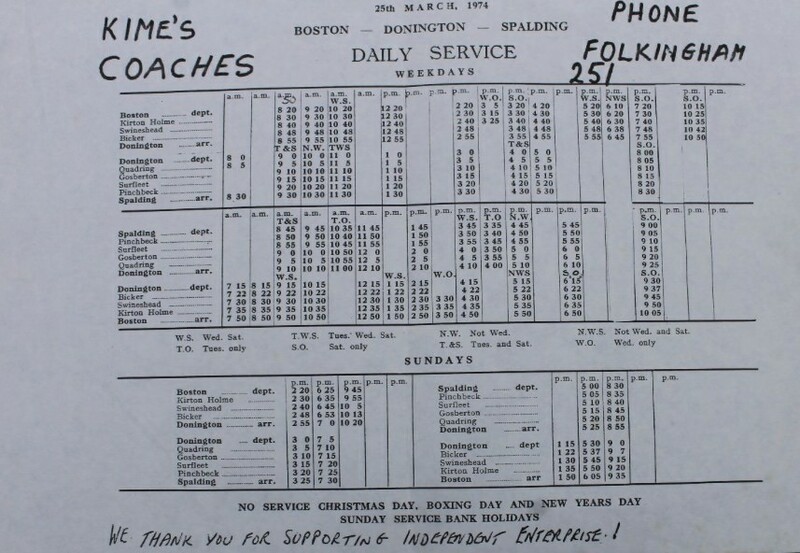 Although no timetable page available to display presumed that the original Coningsby to Boston routes continued after 1960.
an engineering firm in Grantham that seems to have only operated there under their own name for those two years). 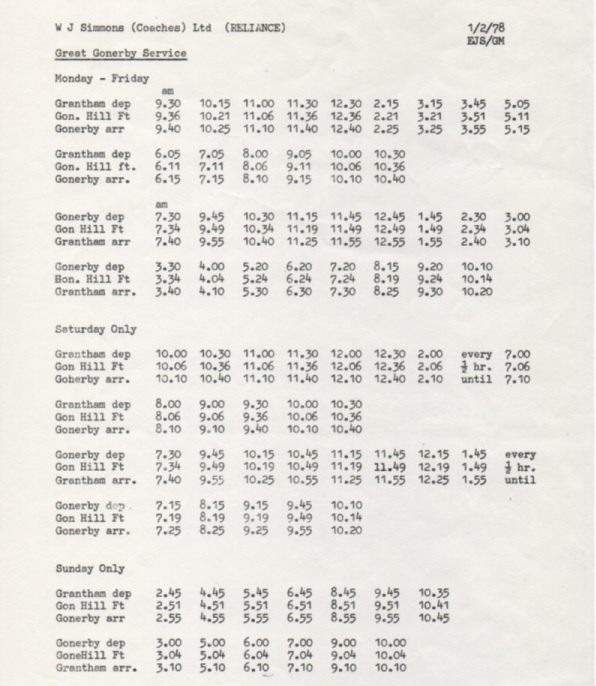 Market day in Newark was Wednesday and in Grantham it was Saturday, accounting for the extra activity on that day. 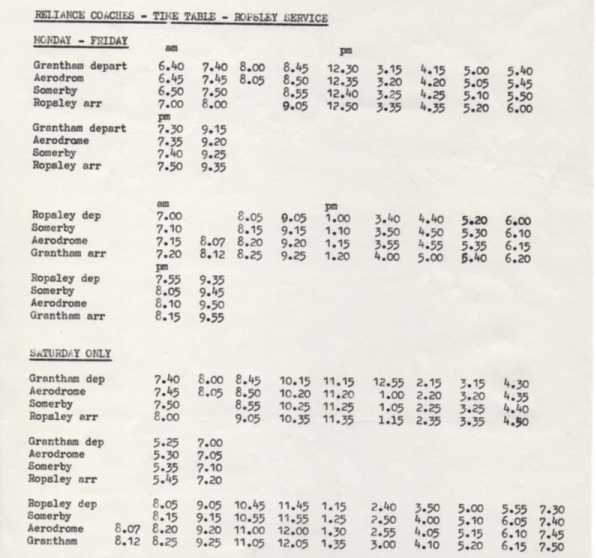 Pulfrey timetable dated September 1982.
but to a more westerly route via Allington, Foston and Long Bennington. 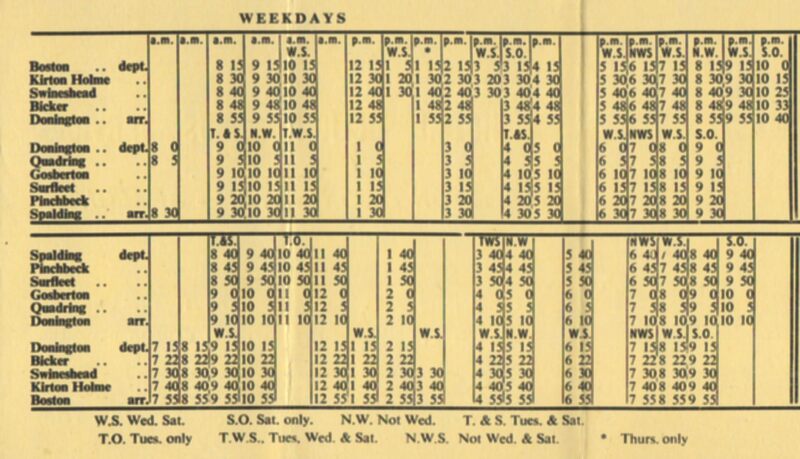 the additional timings obtained with the take-over of Whipple's business (from whom came the rural routes below too). 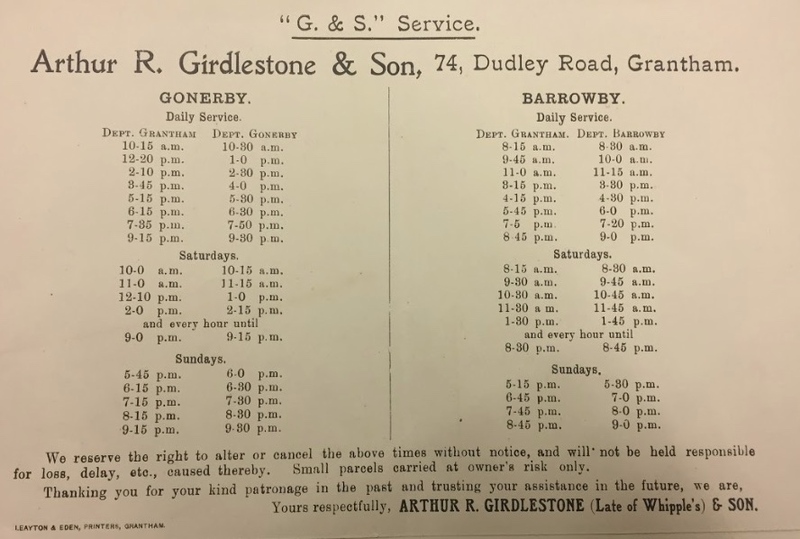 Girdlestone is still operating on these two local Grantham routes at this time and his business has yet to be acquired. 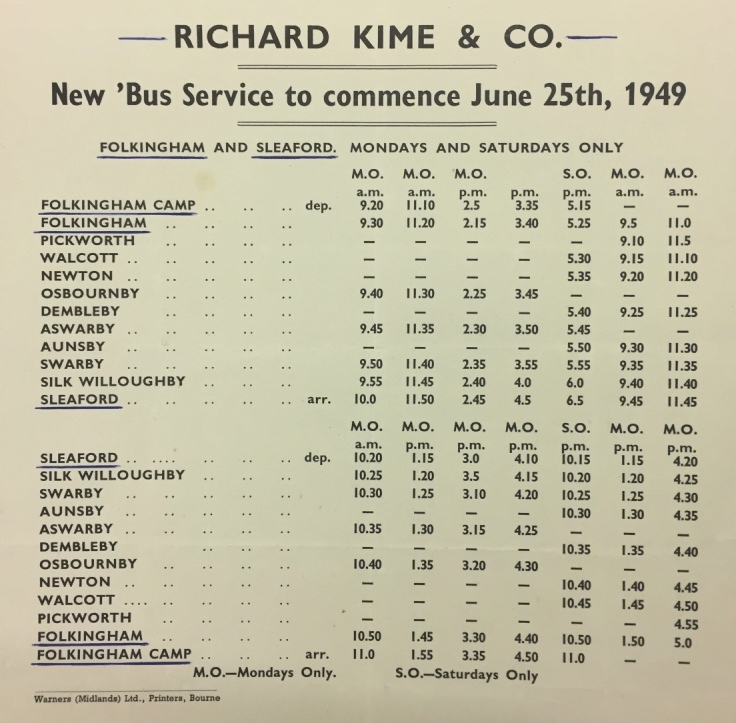 and the country routes to Ropsley, and to Bourne via Irnham, Corby Glen and Swinstead. 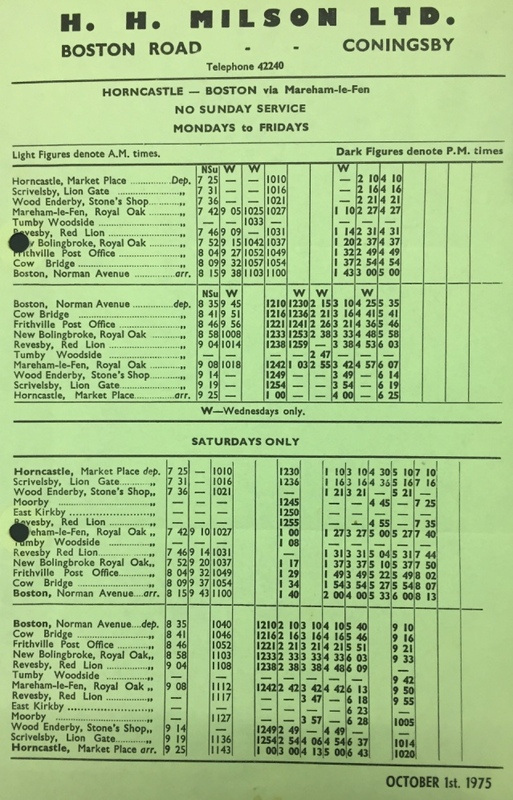 A complete 1961 timetable booklet can be found here. 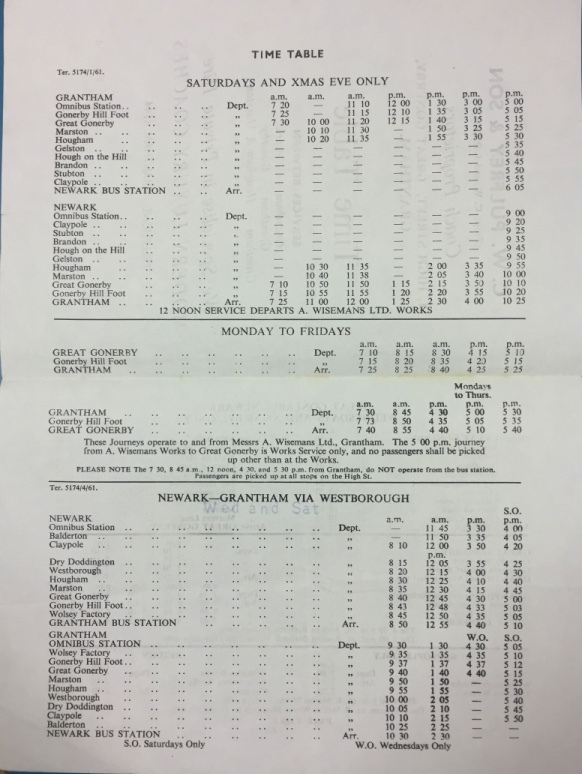 For completeness, an example timetable from the Mass Reliance era, dated June 2004, for the Grantham to Sleaford route. 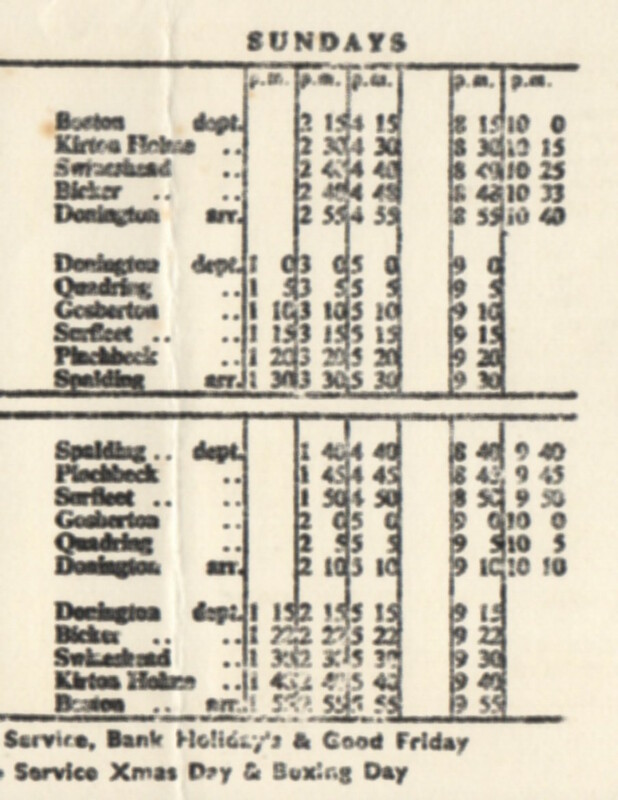 This can be compared with the June 1932 timetable immediately below for the same route when operated by Rickett of Ancaster. 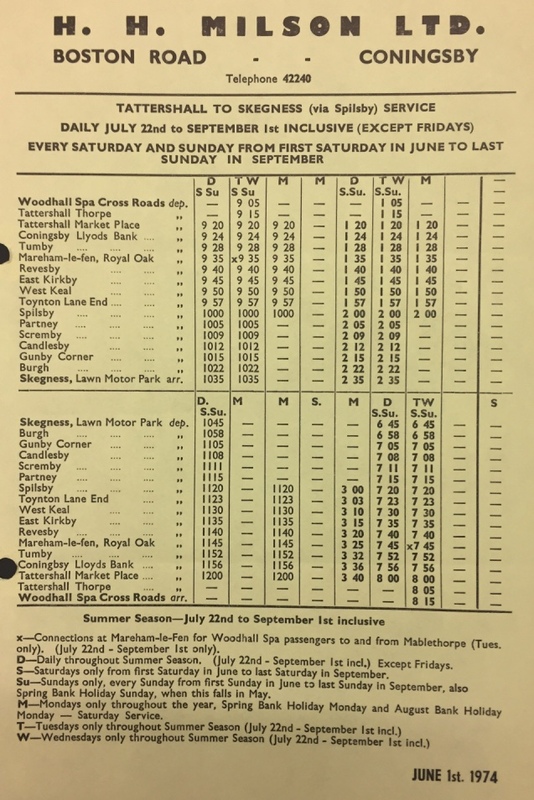 to Skegness as well as excursions from Ancaster. 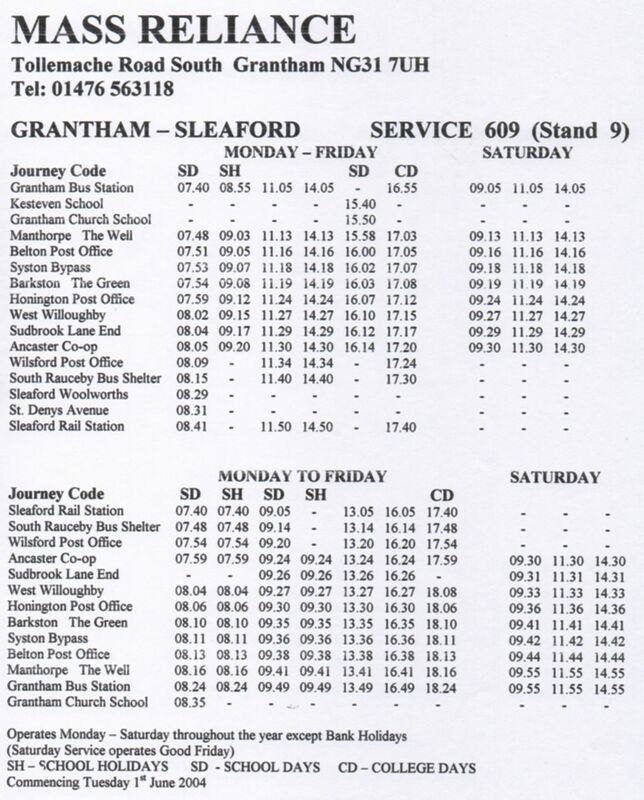 The emphasis of the route appears to have been on Sleaford rather than Grantham. 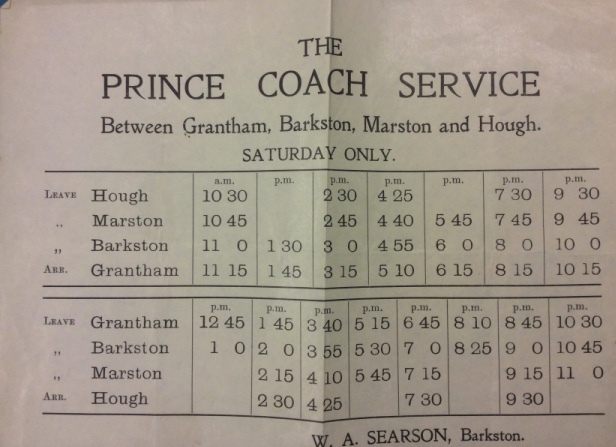 Prince Coach Service, undated pre-war timetable but current in 1932. 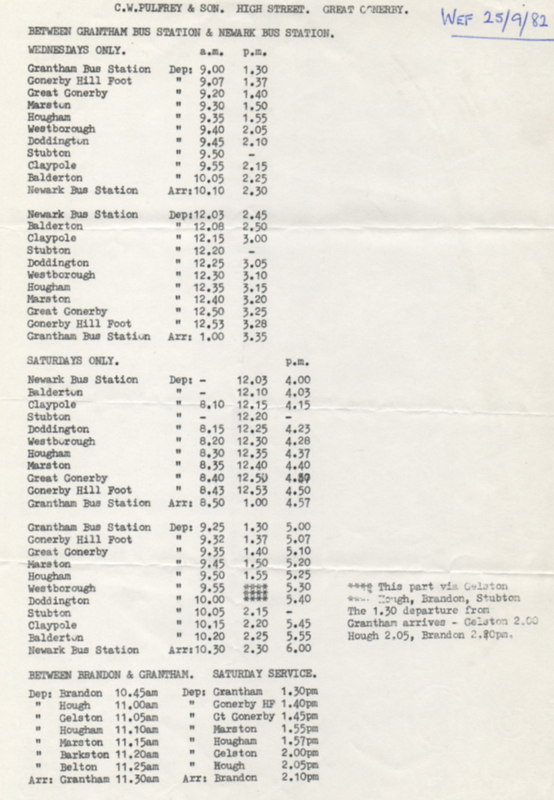 Pulfrey route to Marston left Grantham on the Great North Road. 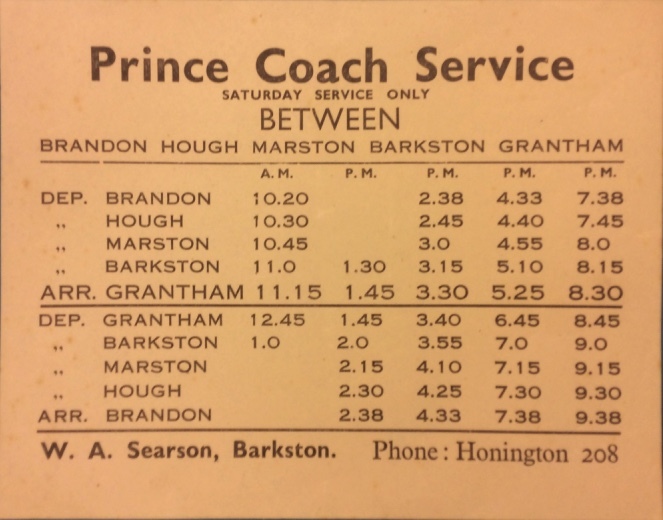 Prince Coach Service, undated post-war timetable, with route extended to Brandon. a circular route returning direct to Marston from Brandon seems not to have been considered. 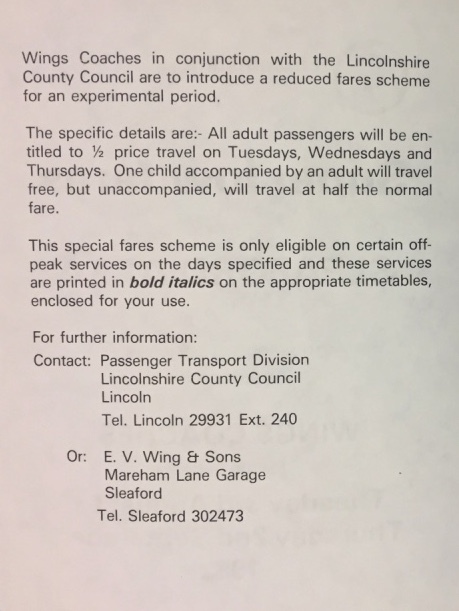 The road between Grantham and Barkston was also covered by Road Car services to Lincoln and Sleaford. 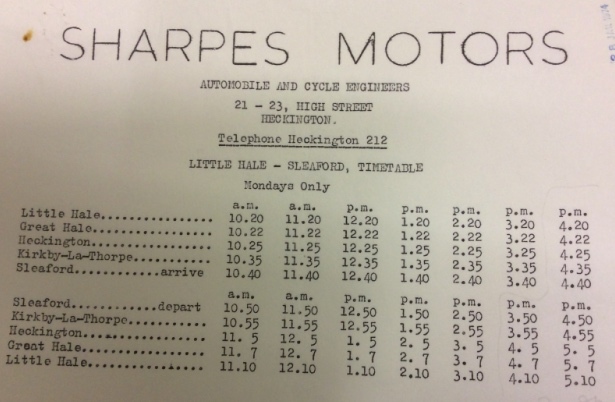 The first timetable is labelled 'proprietor J. Sharpe' so can be no later than 1947 when the business became Sharpes Motors Ltd.
cinema, even distinguishing between when the cinema in Sleaford had one or two evening performances. 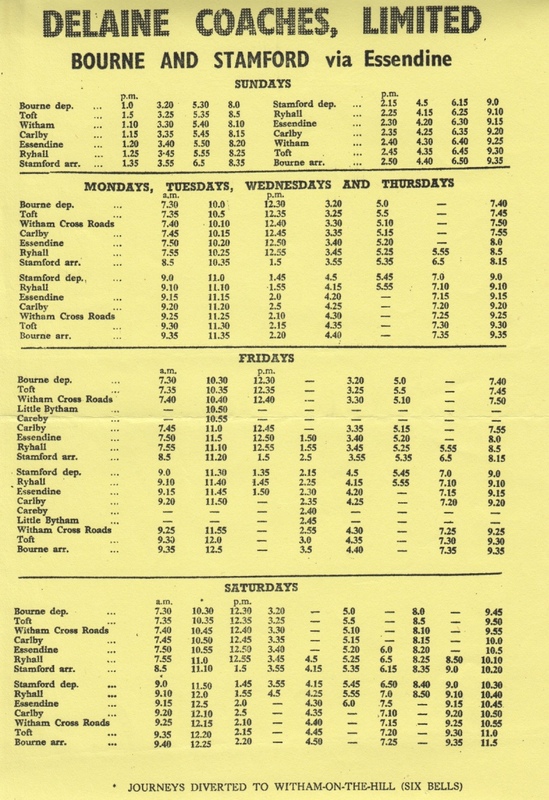 The second timetable would have been current circa 1977, possibly until the end of the service. 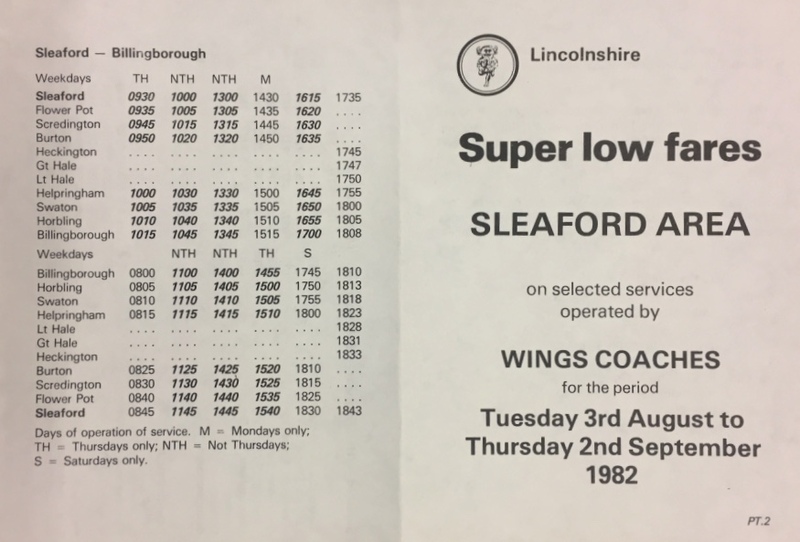 A 1982 timetable booklet from Wings Coaches of Sleaford with special offer fares during the school summer holidays. 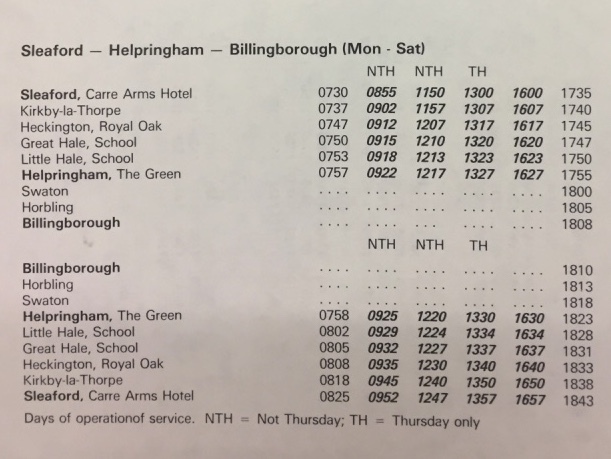 The timetables are for the alternative routes to Helpringham and Billingborough, one via Heckington, the other via Scredington. 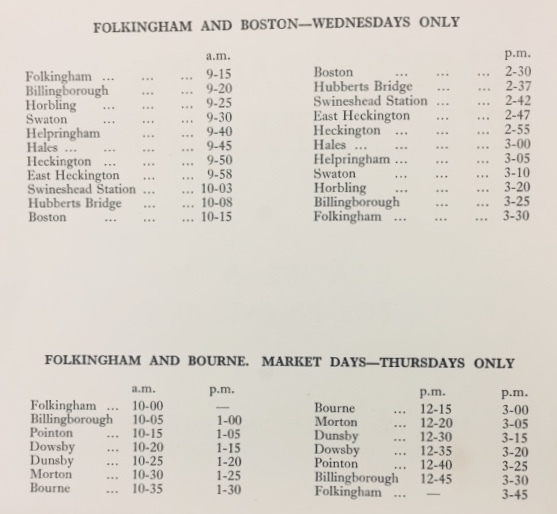 The 0930 trip from Sleaford worked through to Bourne for the Thursday market, returning to form the 1455 from Billingborough.